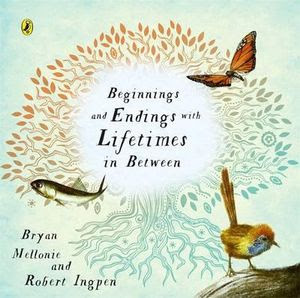 Beginning and Endings with Lifetimes in Between is a valuable book that sensitively assists children and adults to understand and discuss cycles of life and death. Originally published in 1983, it has been released in several formats, with varying covers and titles, including 'Lifetimes: A Beautiful Way To Explain Life and Death to Children'. Every edition features the text of Bryan Mellonie and the artwork of award-winning Australian illustrator, Robert Ingpen. This book continues to be relevant and meaningful, providing a shared language about living, and comfort in times of grief. Mellonie begins with a simple, yet profound, statement, 'There is a beginning and ending for everything that is alive. In between is living.' This lays the foundation for the gentle but clear explanations throughout the book about lifetimes and how some may be shorter while others may be longer. Mellonie provides examples from the centenaries of tall trees to the months of mice to the delicate days of butterflies, always with the explanation of 'This is the way they live and that is their lifetime', before guiding the reader to consider the lifetimes of people. Ingpen's illustrations display exquisite attention to detail with realistic representations of animals, plants, insects and people, focusing on their unique lifetimes. Robert Ingpen has been awarded the Dromkeen Medal and the international Hans Christian Andersen Medal for his children's illustrations. Beginning and Endings with Lifetimes in Between is a gentle book that helps us to remember the value of every lifetime no matter how long or short.